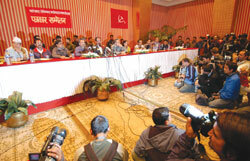 NO LONGER REBELS: Maoist chief Pushpa Kamal Dahal at his first open press conference after coming aboveground, with senior comrades including Deb Gurung, Krishna Mahara, Baburam Bhattarai, Ram Bahadur Thapa, Dinanath Sharma, and his wife Sita Poudyal. The agreement, when it came at midnight, was greeted the morning after with a combination of over-the-top optimism and anger at the Maoist high-handedness in the capital. But around the edges of the euphoria were hints of wariness and warning. "There comes only one chance on one day in an age," Pushpa Kamal Dahal quoted the late poet Gopal Prasad Rimal during his first public press conference in the capital on Wednesday. "I thought of the poem while signing the agreement," Dahal told reporters. The fact that he was quoting a poem adopted by the UML is ironic at best. And another bad sign: jousting for political space and polarisation between parties has already begun in earnest. The Maoists claim they 'sacrificed' their decade-long rebellion, and Madhab Nepal claims his party is the binding force between the Maoists and the seven parties. The two Congresses will likely wait and watch for the next few weeks, and move in to the growing rift caused by the tussle between the communists. The composition of the interim government was reached through meticulous seat-by-seat negotiation between all parties. On paper, it seems as if the Maoists have gained little. But it was a major concession for the Congresses to hand an underground armed rebel movement almost an equal number of seats as they themselves have in the interim house. In practice, the 16 seats for non-party members will likely be filled by civil society leaders, many of whom have fairly consistently toed the Maoist line. The militia, vigilante groups, and public security-and that of Maoist leaders-remain potential flashpoints. The arms management arrangement focuses, for the purposes of the deal, on the 'People's Liberation Army'. But the Maoist militia remain at large, and international human rights observers told us, on condition of anonymity, that senior militia leaders closest to the Maoist top brass went underground shortly before the deal was clinched. The fear of reprisals, which made Dahal and Bhattarai ask for police protection for their headquarters in the capital right before the agreement was signed, is likely to be intense for most local rebel leaders. But some top militiamen told us they'd never give up their arms despite the agreement. A team of conflict experts which toured the tarai last week, also reported seeing small arms being brought over from India, reportedly for sale to militia in Morang. Two weeks ago a large cache of arms was raided in Morang's Bihuni village. The agreement addresses the issue of interim local governance vaguely, noting only that 'interim local bodies in villages, municipalities and districts will be constituted on the basis of the agreement between seven political parties and the Maoists'. But there are no guidelines as to how this 'agreement' is to be reached, how inclusive the bodies will need to be, or what their mandate will be in the interim period. GIVE A MAN A STONE: Maoist cadre charging at Valley residents who had staged a sit-in in front of the CPN (Maoist) headquarters on Wednesday. If local bodies are to resemble anything like their pre-insurgency form, the previous leaders need to be able to return to their villages or even just their districts. 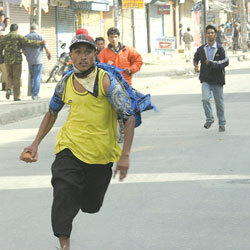 But most popular grassroots politicians now live in Kathmandu and other urban centres, and do not feel safe going back. The text of the agreement states only that it aims to 'ensure an atmosphere for the displaced to return home' and entrusts responsibility for this to district level committeeson both sides. But there is nothing about how the committees will be formed, or who will form them if there are no non-Maoists there to contribute. The role of the United Nations will be an advisory one, and there are questions about how effective UN monitoring of the cantonment and arms lockdown will be, given that the organisation has no enforcement mandate. No comprehensive plan has been formulated yet on how the guerrillas will be registered, and we are told it is likely that a number of the Maoists most trusted and experienced fighters will not be cantoned. So it will be mostly new recruits sent to camp. 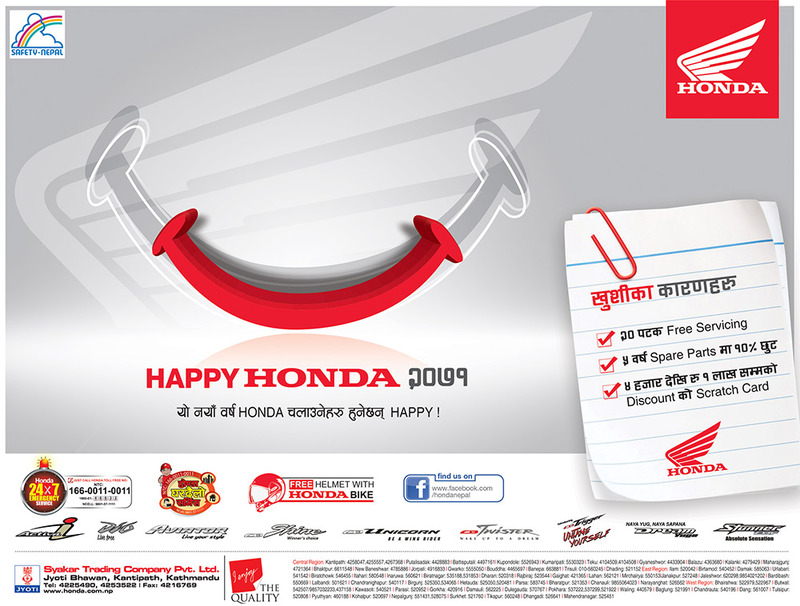 Dahal cancelled his planned address to what was to be a million man march to spare Kathmandu Valley residents 'inconvenience', but citizens in the capital are unlikely to forget their first taste of visiting cadre 'requesting' food and lodging. Nor will they forget being charged at by angry Maoists outside the party office in Kopundole on Wednesday. The Maoists will also have to watch out for disaffected cadre and militia who, if not re-oriented as mainstream political workers, could easily turn against their own party. "There is enough proof on the ground that Maoists are losing control of their cadre," a conflict resolution expert told us, "and this is a real concern." The most pressing weeks will be the next three: by 1 December, all parties need to declare weapons, finalise and implement an interim constitution, and dissolve the parliament and replace it with an interim council of ministers.